confetti by lexi: books, etc. my book club doesn't meet regularly over the summer, but we usually pick a light beach read along with something more book club worthy to pass the time. last summer, with all of the hype surrounding it, of course that book was fifty shades of grey, with the assumption that many of us would continue on with the rest of the trilogy. and because i had recently thrown an epic hunger games party for my daughter (which i also still need to share! ), i was nominated to host the fifty shades book club when school started up again. so, to live up to that expectation, i went all out and had tons of fun with it, starting with my email reminder invite above. straight from the book! the topic and dominant details of the book, along with the timing of the book club definitely called for more festive decor than usual, so i continued to deliver the fun in my dining room. rope, hand cuffs, and the tie, along with roses and kisses - and yes, i even recreated the contract! i also used mini zip ties as napkin rings and printed a few fun signs and tent cards with some of the more memorable (um, overused) quotes from the books. oh my! everyone brings food to share - i think i made a pizza (a nod the girls' packing night) and maybe a salad or pasta. i can't remember anymore, but the important thing from the book was that anastasia ate. it was in that contract up there! in addition to my dinner dish offerings, i had a few book inspired snacks in the living room to be enjoyed during our discussion - kisses & twizzler "ties" (hee hee!) plus a small assortment ranging from "very vanilla" to "spice it up" (haha!). as an added touch on this table, i tied bows around the various pieces of controlling technology christian gifted to anastasia. so much fun and everyone got a kick out of it all! creative credit goes to the book, pinterest, and google for all the fun inspiration. and today, i have to thank carole for the kick in the pants to edit these pics! if you're looking for a beach read and never got around to it before, i say go for it! i bought this in the airport last week on my way out of town and had so much trouble putting it down! you can bet that i'll be devouring the next three as soon as time allows and i can't wait to see the movie later this month. so now that we're back, i'm catching up on things after our quick, but fun trip to dallas. i was really bummed that it was the same weekend as the a muse training in seattle, but david's 20th college reunion trip was already planned. looks like the muses had a blast, though! anyway, i'll have more to post soon. i have a few invites to photograph, plus some in the works, as well as seasonal reasons to stamp! as i've mentioned before, i'm a sucker for a good midnight reveal! i promise to get back to stamping soon, but first i must stick my muggle nose in this magical book! 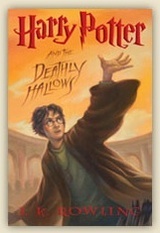 i read year 6 so fast i was really bummed when i finished, so i promised myself to read this last one a little slower!